Join the Bon Appétit at Goucher team and Sustainability Fellow Peter Todaro for a kitchen tour of the new Mary Fisher Dining Hall. 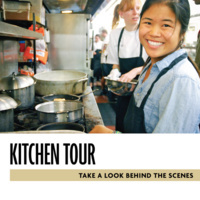 See the inner workings of the kitchen, ask questions, and learn about the culinary and sustainability practices that go into producing your food! Meet by the entrance to Mary Fisher Dining.